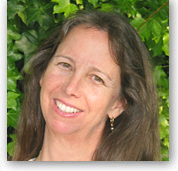 Karen Finch is a Marriage and Family therapist in private practice in Berkeley, CA. She has a Masters in Somatic Counseling Psychology. She works with individuals and couples to access communication and emotional resources and choice fullness. Karen helps her clients address diverse challenges using knowledge from attachment psychology, neuroscience, spiritual traditions and life experience, and relying upon her training in the Hakomi Method, a mindfulness and body oriented psychotherapy. Karen enthusiastically passes on what she has learned as she supervises students studying to become therapists, facilitates at workshops and training seminars, and provides consultation to peer counselors. She teaches Yoga-dance, a fusion of movement forms, that promotes strength, balance and flexibility. Karen has two daughters in their 20's who have taught her many life lessons.